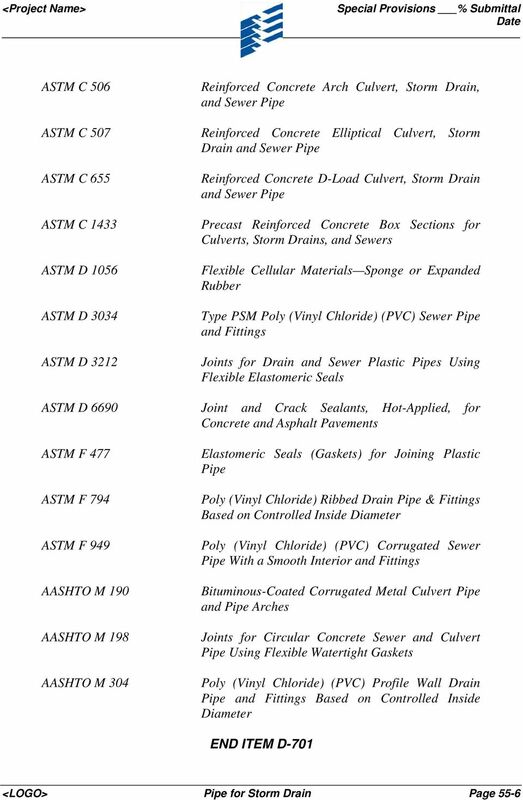 Download "SECTION 55 PIPE FOR STORM DRAINS AND CULVERTS (FAA D-701)"
SUBDRAINS AND FOOTING DRAIN COLLECTORS. 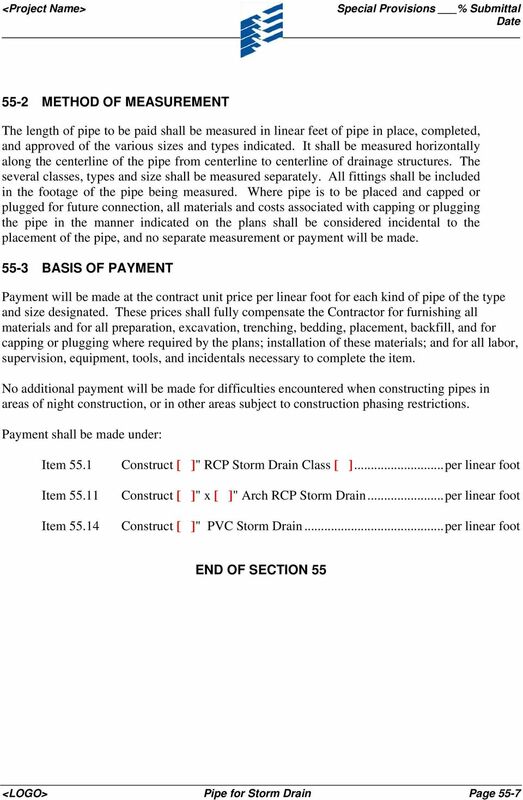 A. Construct subdrains, subdrain cleanouts and outlets, and footing drain collectors. SECTION LS 2530 SANITARY SEWERS. A. 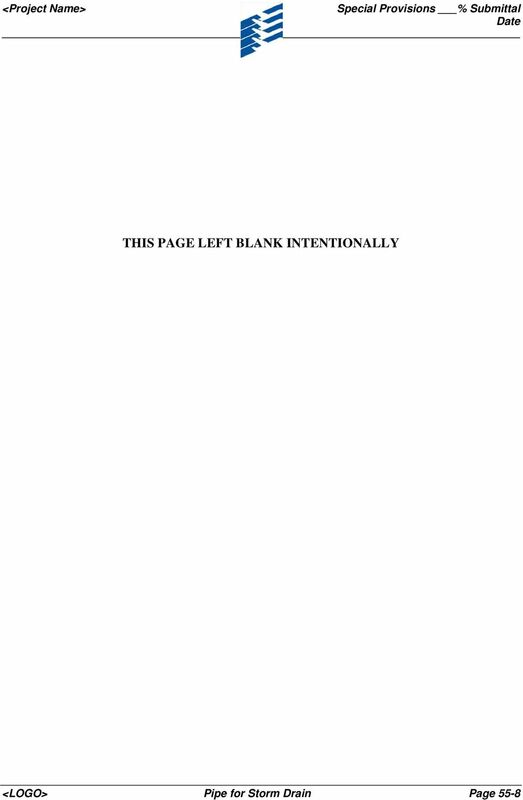 General: Submit the following in accordance with The General Conditions. A. Contractor shall furnish, to the Engineer, all materials certifications available from the manufacturer for all required materials. 32-02.05 Precast Manhole Sections and Castings. These items shall conform to Section 31, "Storm Drain Installation," of these Standard Provisions. SECTION 02530 STORM DRAINAGE STRUCTURES. 1. Trench excavation, backfill, and compaction; Section 02250. 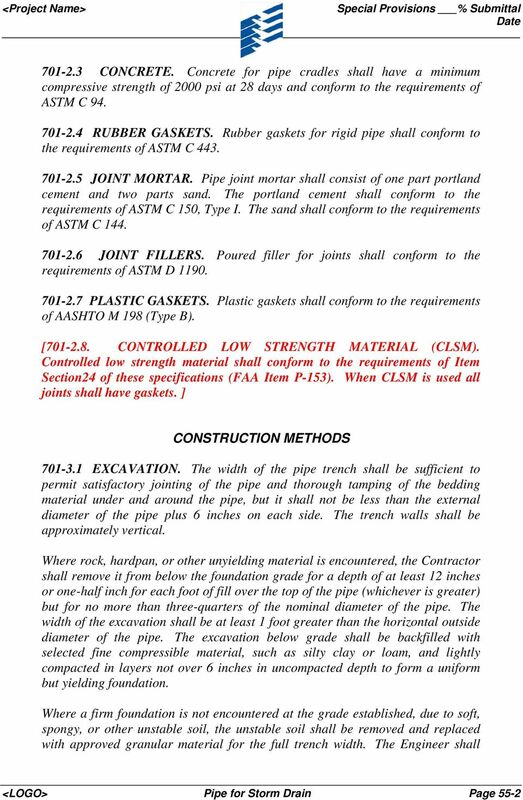 The work of this Section includes furnishing and installing Reinforced Concrete Pressure Pipe as shown on the Drawings and as specified. 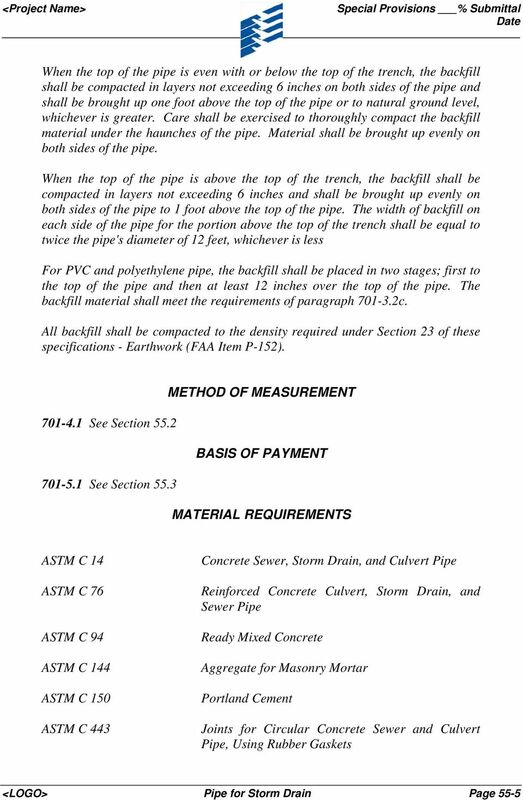 Section 33 0200- Page 1 of 4 PART 1 - GENERAL 1.1 DESCRIPTION OF WORK The work of this Section includes furnishing and installing Reinforced Concrete Pressure Pipe as shown on the Drawings and as specified. SECTION TRENCHING AND BACKFILLING. 1. Section , Temporary Environmental Controls. 2. Section , Excavation and Fill. SECTION 9. 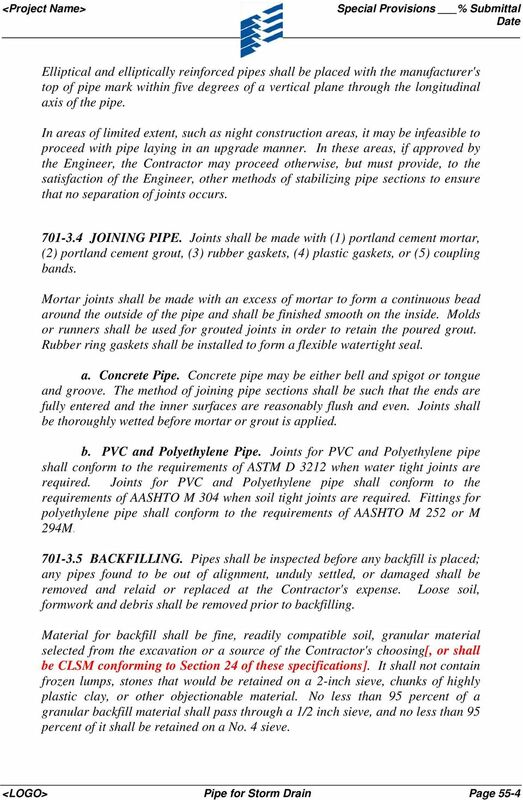 All sewer laterals shall tie into the sewer main lines unless approved by the City Engineer. C. Section 014510 TESTING LABORATORY SERVICE. 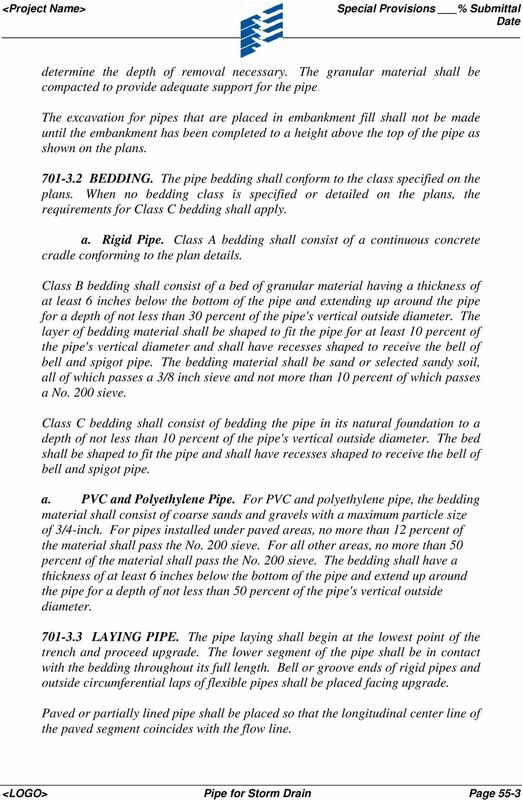 volume of concrete occupied by the drain pipe in a cast-in-place structure or structure extension. INDEX. Sec. No. Items Page Nos. 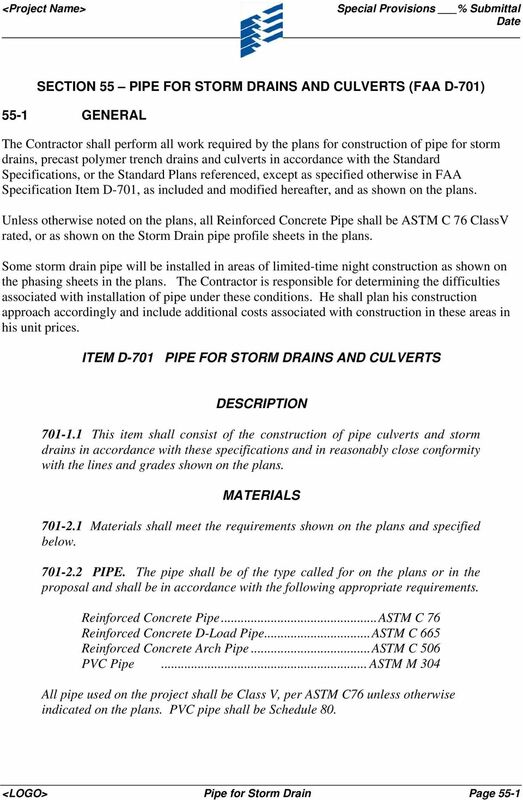 Ultra-Rib PVC Storm Sewer Pipe 8" - 30"
This section includes materials, installation and testing of earthwork for excavations, fills and embankments for structures and sites. SECTION 02763 POINT REPAIRS TO SANITARY SEWERS. A. Repairs to existing sewer lines by replacing short lengths of failed pipe. SECTION 02732 BUILDING SEWERS. B. Connection of building sanitary drainage system to municipal sewers.